Designation: Department Of Pharmacy, G.Pulla Reddy College Of Pharmacy, Osmania University. List of Author(s): Deshpande K, Tadimarri VS, Ghosh B, Uppalapati Y. Copyright: © 2018 Deshpande K. This is an open-access article distributed under the terms of the Creative Commons Attribution License, which permits unrestricted use, distribution, and reproduction in any medium, provided the original author and source are credited. A simple and selective UPLC method is described for the determination of Topiramate Chromatographic separation was achieved on a c18 column using mobile phase consisting of a mixture of 80 volumes of Methanol and 20 volumes of Water with detection of 276 nm. Linearity was observed in the range 50-150 μg /ml for Topiramate (r2 =0.998) for the amount of drugs estimated by the proposed methods was in good agreement with the label claim. UPLC refers to Ultra Performance Liquid Chromatography. It has Equipment that operates at high pressure than that used in HPLC & in this system uses fine particles(less than 2.5μm) & mobile phases at high linear velocities decreases the length of column, reduces solvent consumption & saves time. According to the van Deemter equation, as the particle size decreases to less than2.5 μm, there is a significant gain in efficiency, while the efficiency does not reduce at increased flow rates or linear velocities therefore by using smaller particles, speed and peak capacity (number of peaks resolved per unit time in gradient separations) can be extended to new limits, termed Ultra Performance Liquid Chromatography, or UPLC The technology takes full advantage of chromatographic principles to run separations Using columns packed with smaller particles (less than 2.5μm) and/or higher flow rates for increased speed, this gives superior resolution and sensitivity. The UPLC is based on the principal of use of stationary phase consisting of particles less than 2.5 μm (while HPLC columns are typically filled with particles of 3 to 5 μm). v is the linear velocity, the carrier gas flow rate. *The A term is independent of velocity and represents “eddy” mixing. It is smallest when the packed column particles are small and uniform. The B term represents axial diffusion or the natural diffusion tendency of molecules. This effect is diminished at high flow rates and so this term is divided by v.
* The C term is due to kinetic resistance to equilibrium in the separation process. Thus, term is proportional to v.
Provides the selectivity, sensitivity, and dynamic range of LC analysis. Expands scope of Multi residue Methods. Due to increased pressure requires more maintenance and reduces the life of the columns of this type. So far performance similar or even higher has been demonstrated by using stationary phases of size around 2 μm without the adverse effects of high pressure. In addition, the phases of less than 2 μm are generally non-regenerable. The Ultra Performance Liquid Chromatography have the ability to work more efficiently with higher speed, sensitivity and resolution at a much wider range of linear velocities, flow rates and backpressures to obtain superior results Figure 1. 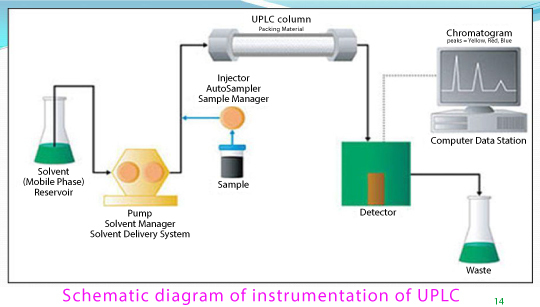 Schematic diagram for UPLC instrument. Figure 1: Schematic diagram for UPLC instrument. Guidelines for Analytical Method Development Figure 2. Guidelines for analytical method development. Figure 2: Guidelines for analytical method development. Performance characteristics to be considered during the validation of a quantitative method in analysis. Drug Name: TOPIRAMATE Figure 3. The precise mechanism of action of topiramate is not known. However, studies have shown that topiramate blocks the action potentials elicited repetitively by a sustained depolarization of the neurons in a time-dependent manner, suggesting a state-dependent sodium channel blocking action. Topiramate also augments the activity of the neurotransmitter gamma-aminobutyrate (GABA) at some subtypes of the GABAA receptor (controls an integral chloride channel), indicating a possible mechanism through potentiation of the activity of GABA. Mobile Phase: A mixture of, 80 volumes of Methanol, and 20 volumes of Water. The mobile phase was sonicated for 10 min to remove gases Table1-3. Preparation of standard stock solution of Topiramate: 10 mg of Topiramate was weighed and transferred in to 100ml volumetric flask and dissolved in methanol and then make up to the mark with methanol and prepare 10 μg /ml of solution by diluting 1ml to 10ml with methanol. The wavelength of maximum absorption (λmax) of the drug, 10 μg/ml solution of the drug in methanol were scanned using UV-Visible spectrophotometer within the wavelength region of 200–400 nm against methanol as blank. The resulting spectra are shown in the 8.3 and The absorption curve shows characteristic absorption maxima at 276nm for Topiramate, selected as detector wavelength for the UPLC chromatographic method. Various analytical development trails has been performed by using different chemicals and reagents, organic solvents at different pH ranges and strengths in differents proportions of buffer and organic solvents to separate the peak shape. Based on the observations and conclusions obtained from the no.of chromatographic trails performed on UPLC, a particular set of chromatographic conditions were optimized to be suitable for estimation of the Topiramate in the tablets. The optimized chromatographic conditions which are found to be suitable for the estimation of Topiramate are given below. Standard solutions were prepared as per the test method and injected into the chromatographic system. The system suitability parameters like retention times, theoretical plates, asymmetric factor were evaluated. Preparation of standard solution: Weigh accurately 10 mg of Topiramate in 25 ml of volumetric flask and dissolve in 25ml of mobile phase and make up the volume with mobile phase. From above stock solution 20 μg/ml of Topiramate is prepared by diluting 0.5ml to 10ml with mobile phase. This solution is used for recording chromatogram. Sample preparation: weigh accurately 10 Tablets (Topiramate -25 mg) weigh accurately 10 mg of Topiramate in 25 ml of volumetric flask and dissolve in 25ml of mobile phase and make up the volume with mobile phase. From above stock solution 20 μg/ml of Topiramate is prepared by diluting 0.5ml to 10ml with mobile phase. This solution is used for recording chromatogram. Standard stock solutions of TOPIRAMATE were prepared by dissolving 100 mg of TOPIRAMATE in 100 mL of Diluent. After that filtered the solution using 0.45-micron syringe filter and Sonicated for 5 min. Accuracy of the method was determined by Recovery studies. To the formulation (pre-analyzed sample), the reference standards of the drugs were added at the level of 50%, 100%, 150%. The recovery studies were carried out three times and the percentage recovery and percentage mean recovery were calculated for drug. weigh accurately 10 mg of Topiramate in 25 ml of volumetric flask and dissolve in 25ml of mobile phase and make up the volume with mobile phase. From above stock solution 20 μg/ml of Topiramate is prepared by diluting 1.5ml to 10ml with mobile phase. This solution is used for recording chromatogram Figure 4. Figure 4: Chromatogram of Topiramate. All the system suitability requirements were met. The efficiency was more than 2000 Topiramate. Resolution between two peaks >1.5. hence this method was for optimized. Linearity and range: Table 7. Linearity data of TOPIRAMATE Table 8. Linearity graph of TOPIRAMATE Figure 5. Table 6: Results for system suitability of TOPIRAMATE. Table 8: Linearity data of TOPIRAMATE. Table 9: Recovery results for TOPIRAMATE. Table 10: Method precision results for TOPIRAMATE. Figure 5: Linearity graph of TOPIRAMATE. To demonstrate the robustness of the method, prepared solution as per test method and injected at different variable conditions like using different conditions like flow rate and wavelength. System suitability parameters were compared with that of method precision Table 11. Table 11: Results for Robustness of TOPIRAMATE. The ruggedness of the method was studied by the determining the analyst to analyst variation by performing the Assay by two different analysts Table 12. Table 12: Ruggedness Results of TOPIRAMATE. From the above experimental results and parameters it was concluded that, this newly developed method for the estimation of TOPIRAMATE was found to be simple, precise, accurate and high resolution and shorter retention time makes this method more acceptable and cost effective and it can be effectively applied for routine analysis in research institutions, quality control department in meant in industries, approved testing laboratories studies in near future [1-13].